"Discover The Quick & Easy Way To Get A LOT More Visitors To Your Website For FREE With Just A Few Simple HTML Tweaks ..."
Did you know that a few quick and easy changes to your website can give you an almost instant BOOST in the search engines and bring you a LOT more traffic for free? The search engine spiders which index your website are unfortunately easily confused. And because of this, Google often doesn't rank your pages as high as they should be ranked. A few simple changes to your web pages can give your sites a huge search engine boost. All you need to know is how to structure your pages for maximum effect - WITHOUT - compromising any of your content. And unlike expensive search engine software that does the same thing, in this product I'll reveal the 10 Steps you must take to make sure your pages are fully optimized for Google (also for Yahoo and MSN) so you can easily get a ton more search engine traffic for free. In this in depth product you get sixteen videos that show you exactly how to boost the search engine rankings of your pages quickly, easily and for free. In this video I'll talk you through the difference of "On Page" and "Off Page" Search Engine Optimization, and how to benefit from both. Here I'll show you one simple change you can make to your pages that will make them a lot easier for the search engine spiders to read and understand. The effectiveness of this simple change will surprise you. In this video I'll show you how one single element of the page can cost you very dear. You probably don't even consider this when creating a page; most don't. But by overlooking it you're losing a boatload of free traffic. Here I'll show you how to boost the search engine relevancy of your pages in literally eleven seconds flat. In this video I'll show you how to structure probably the most important section of your whole page. So many people get this wrong, but with this video you'll know better, and will find it much easier to list higher than your competition! Here I'll talk you through how to effectively use "hidden tags" in your pages. In this video I'll show you how to easily influence exactly which description text the search engines use for your site. Here I'll talk you through one of the most important HTML elements of your page that will help your search engine rankings greatly. In this video you'll discover how to structure your page text so it's exactly what the search engines are looking for. Here you'll discover how to automatically (and for free) check that you haven't over optimized your page into what search engines consider "spam". I've seen software selling for $100+ (amazing but true) that does this, but I'll reveal where to get the same functionality for free. In this video you'll discover a clever way to instantly optimize your graphics for the search engines. Here you'll discover the quick and easy way to optimize all the links on your site for the search engines. In this video you'll discover a very little known way to instantly boost the relevancy of your page links. 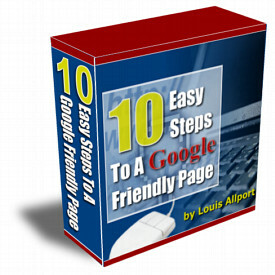 Here you'll discover the automatic way to make sure the search engine spiders LOVE your pages. In this video I'll show you how to easily avoid one of the biggest pitfalls ... that if you don't fix now will lose you ranking and even get your site banned from the search engines entirely! Here you'll discover what NOT to do on your pages if you're serious about free search engine traffic. Many people still use these outdated and downright dangerous tactics on their pages thinking it will help them get more traffic. In fact it does the exact opposite. Then search Google for "Louis Allport" and see what you find. At this time I see up to 847 websites selling my products ... and up to 2,580 sites when I search Yahoo! I'm telling you this so that you realize there really is absolutely no risk to you at all. Click here now to order. If you're looking right now for proven ways to get more free search engine traffic, this eBook will save you days, even weeks, of frustrating, tiring and downright misleading research. It will also save you from wasting the months I did trying to actually find what works with search engines from the flood of misinformation and downright lies all over the forums and in articles. Get all your questions answered now - get a copy of this video eBook and I'll show you how to optimize your web pages for the search engines within the hour and be on the way to getting a LOT more traffic. I guarantee you'll be amazed how easy it is!